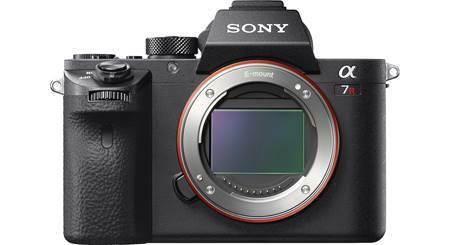 If you're into shooting twilight scenes, nightscapes, or theater performances, you might want to take a good, long look at the Sony a7S II. This camera shares its acclaimed predecessor's reputation for incredible low-light performance. Fewer megapixels on the generously sized full-frame sensor allow each pixel to be larger and work more efficiently. Large pixels are light-gathering beasts, compared to the smaller-sized pixels of high-megapixel count sensors. Extended sensitivity, low noise levels and high dynamic range ensure fine detail rendering from the darkest shadows to the brightest highlights, for beautiful photos in all lighting conditions. The a7S II also supports 14-bit uncompressed RAW images for the highest quality tonal gradation, so you can fully capitalize on the camera's wide dynamic range. 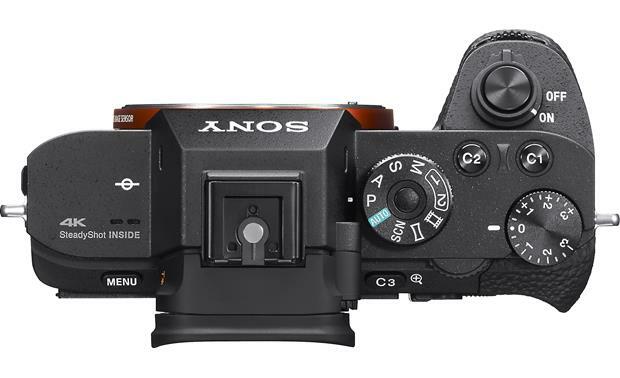 The Sony Alpha a7S II has a 3" monitor that tilts up or down to help you compose shots from different angles. The a7S II's Fast Intelligent autofocus system gives you accurate contrast detection and quick focus even when light and visibility are low. And when it comes to video, the a7S II is a solid performer with an impressive array of features for videographers on all levels. The a7S II produces stunning, low-noise, Full HD video which, at 120 frames per second, blows most of its competition right out of the water. In Super 35mm format, data is processed from every pixel for sharp, finely detailed footage. This camera also records in 4K in full-frame format. A multi-interface shoe lets you connect professional microphone kits for balanced audio to match the video quality. The a7S II's enhanced Zebra function tells you which parts of a scene are overexposed so you can easily make adjustments, and Gamma Display Assist allows you to view the scene with natural contrast on the LCD or in the viewfinder. Advanced features like Picture Profile and the new S-Log3 Gamma setting let you adjust color, gradation, and dynamic range for richly detailed movies in any light. A clean HDMI output sends uncompressed movie data to an external recorder or monitor. You can keep recording with the camera even when using this function. 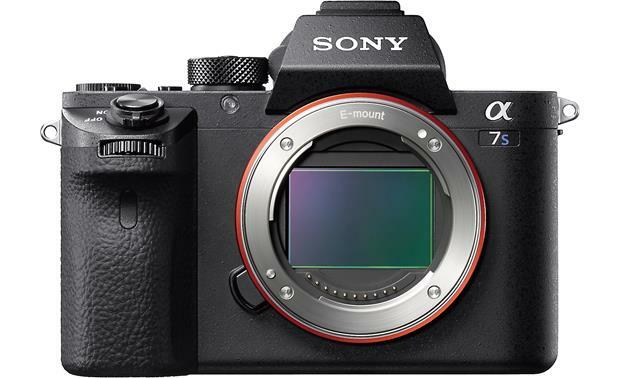 Sony has taken plenty of steps to ensure the a7S II produces crystal-clear photos and shake-free videos. Five-axis image stabilization optimized for high-resolution sensors compensates for camera shake from five different directions, giving you freedom to shoot handheld, zoom in on distant subjects, and capture sharp night scenes. You can monitor the effects of camera shake compensation in the viewfinder or LCD screen while shooting and adjust framing and focusing if needed for steady results. 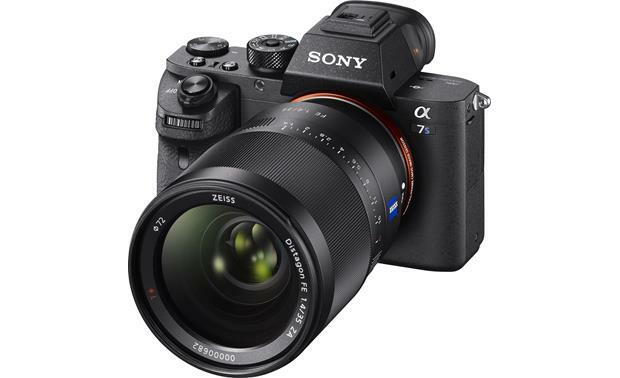 The a7S II's reduced-vibration shutter has a braking mechanism that cuts down on vibration, and Silent Shooting Mode uses an electronic shutter that cuts out shake caused by mechanical shutter movement. Built-in Wi-Fi means you can instantly transfer photos and videos from the a7S II directly to your phone or tablet for easy uploading and sharing. NFC touch pairing is also available for compatible Android™ devices. Sony's PlayMemories Camera Apps include free and paid apps that complement your photographic style and interests. There's the indispensable free Smart Remote Control app that lets you use your mobile device to control shooting on the a7S II, along with specialized apps for things like light painting, time-lapse, stop motion, and multiple exposure, plus plenty of editing effects to fine-tune your photos and add your own personal touches. weight (with battery): 22.1 oz. Fantastic Camera for video. The best in low light. 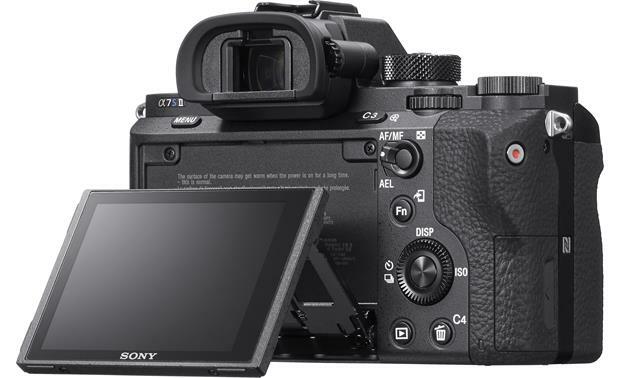 Overview: The Sony α7SII (ILCE-7SM2) Interchangeable-lens digital camera kit contains the α7SII camera body, along with two rechargeable batteries, battery charger, adjustable neck strap, and USB cable. The α7SII has a full-frame 35mm image sensor, and is compatible with Sony E-mount lenses. With the LA-EA4 Mount Adapter, the camera can also use Sony A-mount lenses. 3" Tiltable LCD Screen: The α7SII uses a 3" LCD screen with 1,228,800 dots. You can tilt the LCD up approximately 107° for low angle shots or tilt it down approximately 41° for high angle photography. The brightness of the LCD monitor can be adjusted in 5 steps from -2 to +2, plus a Sunny Weather mode. 0.51" OLED Electronic Viewfinder: The 0.51" high contrast Tru-Finder OLED electronic color viewfinder has 2,359,296 dots, and provides approximately 100% field of view. The viewfinder has a Zeiss T* (T-star) coating to reduce surface reflection, and features the world's highest viewfinder magnification of 0.78x. You can adjust the brightness in 5 steps. The built-in diopter lets you adjust the viewfinder image to your individual eyesight. 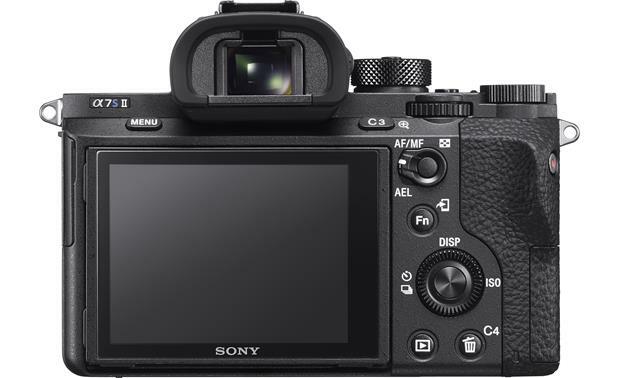 You can set the camera to switch between the LCD screen and viewfinder automatically when you look into the EVF, or choose one or the other in the camera's menu. Display Modes: In the viewfinder and monitor, you can choose from the following display types: Graphic Display, Display All Info, Display No Info, Histogram, and Digital Level Gauge. Live View: The α7SII's Live View lets you use the LCD screen and Electronic Viewfinder to frame your photos as you shoot. When the Live View display is set to "Setting Effect On", the LCD or viewfinder will provide an accurate preview of your photo, including the white balance, exposure compensation, creative style or picture effect. With the "Setting Effect Off", you can check the image composition without the effects of the exposure settings. 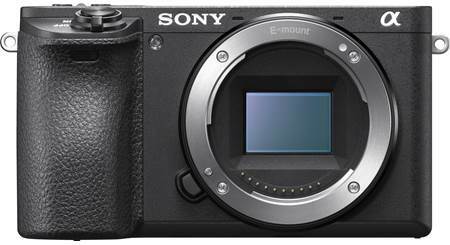 Image Sensor: The α7SII features a back-illuminated, full-frame 35mm Exmor CMOS image sensor (35.6 x 23.8mm) with a 3:2 aspect ratio. It has approximately 12.4-million total pixels and 12.2-million effective pixels. When recording at 100 Mbps or more, UHS Speed Class U3 is required. Clear Image Zoom: Clear Image Zoom, powered by Sony's By Pixel Super Resolution Technology, increases the effective focal length of the lens by up to 1.5x (Medium images) or 2x (Small images) by digitally magnifying the center of the image with no image degradation. A separate Digital Zoom of approximately 4x is also available. Direct Manual Focus (DMF): After focusing automatically, you can make fine focusing adjustments manually by turning the focus ring on the lens. Expand Flexible Spot: If focus isn't possible on the single selected point, it uses focus points around the flexible spot as a secondary focus area to facilitate focus. Lock-on AF: When the shutter button is pressed halfway, the camera tracks the subject within the select AF area. You can select the desired tracking start area by designating the area as a flexible spot or an expanding flexible spot. Auto Object Framing: When the camera detects and shoots faces, subjects shot with macro or subjects captured using Tracking Focus, the captured image is automatically trimmed into a suitable composition. Both the original and the trimmed images are saved. The trimmed image is recorded in the same size as the original image size. This feature can be turned on or off in the menu. AF Illuminator: When you press the shutter button halfway down a red illuminator is emitted until the focus is locked. Under dark lighting conditions or when you shoot a low contrast subject, the AF illuminator allows the camera to focus more easily on the subject. The AF illuminator has a range of 0.99' to 9.8'. SteadyShot Inside: The α7SII is equipped with sensor-shift-type SteadyShot image stabilization system to reduce the effect of camera shake. This system allows you to photograph faraway objects without the blur of camera shake. 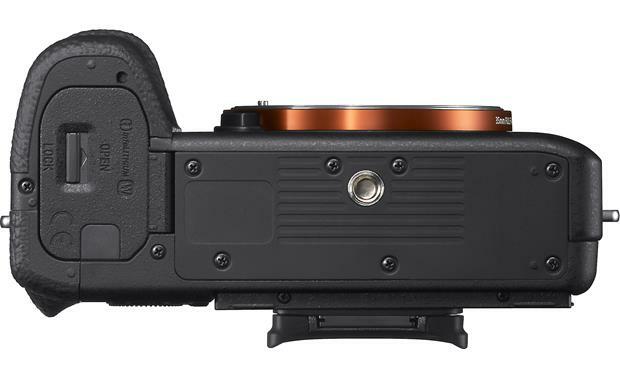 SteadyShot INSIDE features 5-axis compensation with an effect equivalent to 4.5 stops faster shutter speed. It can compensate for camera shake in the following ways: Horizontal, Vertical, Pitch, Yaw, and Roll. Drive Modes: The camera offers the following shooting modes: Single shooting, Continuous Shooting, Speed Priority Continuous shooting, Self-timer, Self-timer Continuous, and Bracketing (continuous, single, white balance, and DRO). Continuous Self-timer: The camera records 3 or 5 images continuously after a 10, 5, or a 2 second delay. You can choose the best shot from the multiple shots taken. Bracketing Self-timer: The camera records multiple images, each with a different exposure, after a 10, 5, or 2 second delay. Bracket Shooting: Bracket shooting allows you to shoot 3, 5, or 9 images, each with different degrees of exposure, white balance, flash intensity, and dynamic range. You can select the increment steps for each frame of the bracket. Shutter Speed Priority: This mode allows you to shoot after adjusting the shutter speed manually, letting the camera set the appropriate aperture. You can choose a shutter speed of 1/8000 to 30 seconds for still images, or 1/8000 to 1/4 second for movies. With a high shutter speed, the moving subject appears as if it is frozen on the image. With a slow shutter speed, the moving subject appears as if it were flowing. Bulb photography is also available in this mode. Scene Selection: You can select an appropriate mode for the subject or the shooting conditions to allow you to shoot the image with a suitable setting for the subject: Portrait, Sports Action, Macro, Landscape, Sunset, Night Scene, Hand-held Twilight, Night Portrait, and Anti Motion Blur. Memory Recall (1, 2): You can register often-used camera settings (including Shooting Mode, Aperture, Shutter speed) in one of two memory positions on the Mode Dial for easy recall. Movies/High Frame Rate: You can record movies in 4K, Full HD, or standard definition in 16:9 aspect ratio. When selected on the Mode Dial, you can select the desired movie settings, including Program Auto, Aperture Priority, Shutter Priority, and Manual Exposure. Picture Effect: In Intelligent Auto or Superior Auto mode, you can select Picture Effect to get one the following effect filters to achieve more impressive and artistic expression: Toy Camera, Pop Color, Posterization (color), Posterization (B/W), Retro Photo, Soft High-key, Partial Color (Red, Green, Blue, or Yellow), High Contrast Mono, Soft Focus, HDR Painting, Rich-tone Mono, Miniature, Watercolor, and Illustration. Exposure Compensation: Exposure compensation is used to alter the camera's standard exposure setting. You can make the image look lighter (increased exposure) or darker (decreased exposure) The exposure compensation amount can be set up to +/-3.0 EV in 1/3-step increments by turning the dial on the top of the camera or +/-5.0 EV in 1/3-step or 1/2-step increments in the menu. Multi Segment: This method uses the whole screen divided into 1200 zones to measure light. Center Weighted: While emphasizing the central area of the screen, this method measure the average brightness of the entire screen. White Balance: You can adjust the color tones according to the lighting conditions. You can choose from the following WB options, and adjust the +/- 3 to fine tune the colors: Auto WB, Daylight, Shade, Cloudy, Incandescent, Fluorescent (Warm White), Fluorescent (Cool White), Fluorescent (Day White), Fluorescent (Daylight), Flash, Color Temperature, Color Filter, Underwater, and Custom. ISO Settings: ISO is a unit of measurement of sensitivity to light. The larger the number, the higher the sensitivity. The camera's ISO can be set manually or automatically, depending upon the exposure mode. For still images, the sensitivity can be set to ISO 100 to 102,400, with extension to ISO 50 minimum and ISO 409,600 maximum. ISO Auto will set the sensitivity between ISO 100 and 12,800. For movies, the sensitivity is ISO 100 to 409,600 equivalent manually, or ISO 100 to 12,800 automatic. 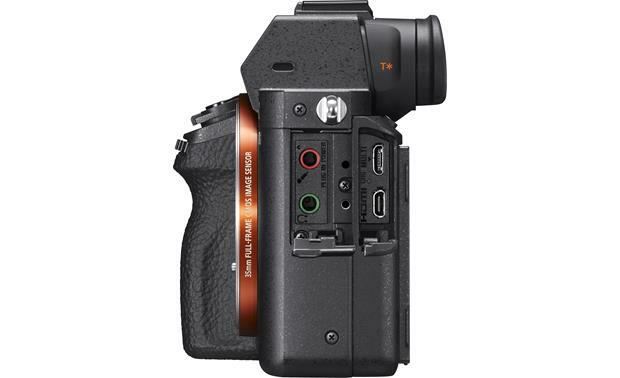 Multi-Interface Shoe: The α7SII does not have a built-in flash, but is equipped with the Multi-Interface Shoe, allowing you to use an external flash, such as the HVL-F20M, HVL-F32M, HVL-F43M, or HVL-F60M. The ECM-XYST1M stereo microphone is also compatible. 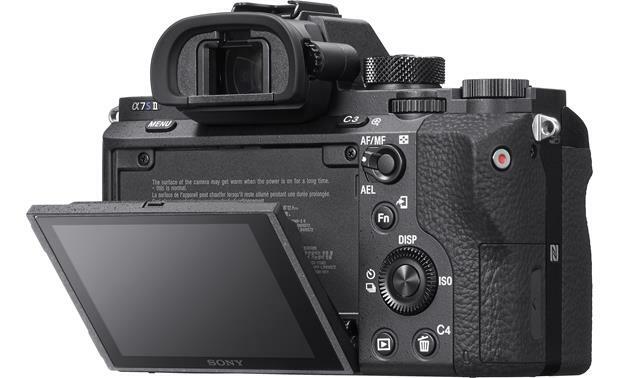 Wi-Fi Overview: The Sony α7SII has built-in Wi-Fi so you can interface the camera with your smartphone or Wi-Fi-enabled laptop computer and wirelessly perform various shooting and playback functions. The camera also supports NFC (near field communication). PlayMemories Mobile: To interface with the Sony α7SII, your smartphone must have the PlayMemories Mobile application. The app is compatible with iPhone, iPad, and iPod touch, and requires iOS 7.0 or later. It is also compatible with Android smartphones and tablets with the Android 4.0-5.1 operating environment. NFC (Near Field Communication): By touching an NFC-enabled Android smartphone or tablet to the "N" mark on the right side of the camera, the smartphone will be connected automatically via Wi-Fi, and the PlayMemories Mobile app will be launched. The two devices must touch for approximately 1-2 seconds to make the connection. Playback Screen: You can view your photos back as a single image on the LCD monitor, as an Index or as a Slide Show. During Index View mode, you can view 9 (3 x 3) or 25 (5 x 5) images at once. Enlarged Display: You can enlarge an image during playback to view details of your photos. The maximum magnification depends upon the size of the original image: Large: 13.3x, Medium: 8.7x, Small: 6.7x. View Mode: Recorded images are divided into folders, allowing you to view only those images in that folder. You can select from the following folders: Still, Date, MP4, AVCHD, XAVC S HD, and XAVC S 4K. 4K Still Image Playback: The α7SII can output images in 4K resolution to an HDMI-connected TV that supports 4K. The 4K playback function can be selected in the Playback Menu only when the camera is connected to a 4K-compatible TV via HDMI or Wi-Fi. 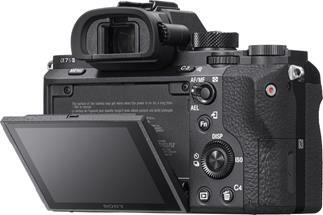 InfoLithium Battery: The α7SII is powered by the NP-FW50 InfoLithium battery (supplied). The battery communicates data to the camera, so that the percentage of battery power remaining can be displayed. Charging: The camera comes with the BC-VW1 battery charger and the AC-UUD11 AC adapter, allowing you to charge the NP-FW50 battery outside the camera or inside. Using the battery charger, the battery is charged in approximately 4 hours 10 minutes. Charging the battery inside the camera, with the included USB cable and AC adapter, takes approximately 2 hours 30 minutes. 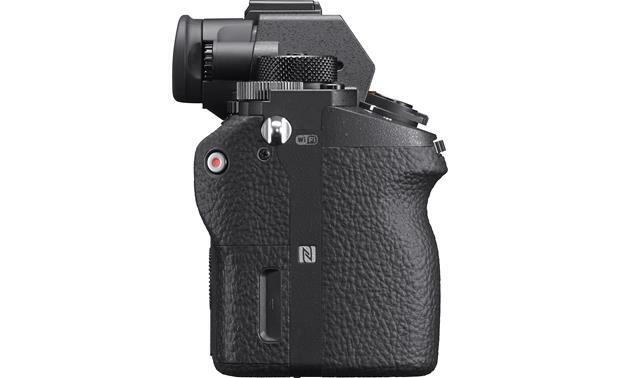 Optional Battery Grip: With the optional VG-C2EM Vertical Grip, and an additional NP-FW50 battery, you can double the battery life of the camera. HDMI: The camera has a Micro HDMI (Type D) connector that allows 4K movie and 4K still image playback. It is also compatible with BRAVIA Sync, which allows you to control the camera with the TV remote, when connected to a BRAVIA Sync TV. No HDMI cable is included. Digital Terminal (USB): The camera's Micro USB port lets you connect the camera to your home computer for transferring photos and movies. The digital interface is compatible with Hi-Speed USB (USB 2.0). Connecting the camera to your PC via USB also provides power to the camera to save battery life during extended use (camera on), or to charge the battery (camera off). Microphone: A 3.5mm stereo minijack is provided for connecting a microphone. Headphone: The 3.5mm stereo headphone jack lets you listen to audio through headphones during movie recording or playback. PlayMemories Home: With PlayMemories Home, you can view your images, and use various convenient features to enhance the images you have shot. PlayMemories Home is required for importing AVCHD movies to your computer. Compatible with Windows 10, 8.1/8, 7 (SP1), Vista (SP2), and Mac OS X v10.8-10.10. PlayMemories Camera Apps: The α7SII is compatible with PlayMemories Camera Apps, which enables you to add new features to the camera by downloading a new app and installing it in the camera. Apps are available to fit your shooting style, including portraits, close-up photography, sports, time lapse, angle shift add-on, etc. Many apps are available via a free download, while more advanced apps require a fee of $4.99 or $9.99. 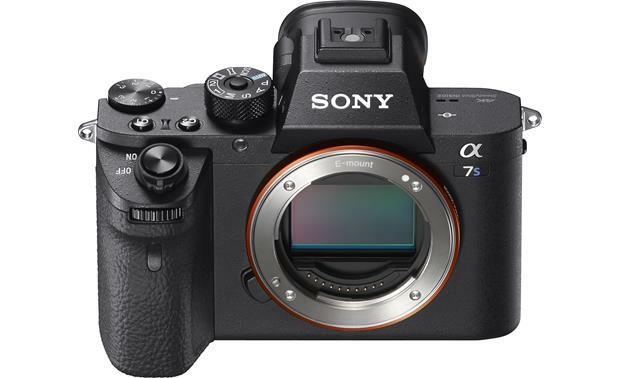 Searches related to the Sony Alpha a7S II Full-frame 12.2-megapixel mirrorless camera with Wi-Fi®.